Perfect for bedroom, bathroom,livingroom,ect. It is soft,comfortable. It can make your home more beautiful. The pure color reflect the simple life style. It can decorate your room elegantly, high class Features: Material: Polyester Color: Coffee/ Silver Grey/ Khaki/ Snow Cyan/ Red/ Creamy/ Beige/ Pink Size:70cm X 80cm/27.55" X 31.49"(appr.) The length of fur:2cm/0.78"(appr.) Package included: 1 pcs X doormat Notice: 1.Please allow 1-3mm error due to manual measurement, please make sure you do not mind before you bid. 2.The colors may have different as the difference display, please understand. Specifications: Shower Curtain Material: Polyester Mat Material: Flannel Surface + Non Woven Fabric Intermediate Layer + Non Woven Plastic Bottom Color: As picture shown Hook Size: (L)X(W)5.8X4cm/2.28"X1.57"(appr.) Mat Size: (L)X(W)60X40cm/23.62"X15.75"(appr.) Curtain Size: (L)X(W)180X180cm/70.87"X70.87"(appr. )Features: Brand New and high quality. Made of polyester material, waterproof, anti-mildew and safe. Non slip bottom mat, machine washable, not fade. Designed to fit standardized bath tubs. Soft and comfortable hand feeling, easy to clean. Can stop splash water and offer an independent bath space. Attention: Please low temperature washing and ironing, do not bleach and dry clean.Package included: 1 Pcs Shower Curtain + 1 Pcs Mat + 12 Pcs Plastic HooksNotice: Please allow 1-5cm error due to manual measurement and make sure you do not mind before ordering. Please understand that colors may exist chromatic aberration as the different placement of pictures. Features: Super absorbent and fast drying. Washable, breathable and heat-resisting. Resilience, promote the blood circulation of the foot. A perfect ornament in your modern home. Specificaton: Material: Flannel Size: (W)X(L)40 x 60cm/ 15.75 x 23.62",180g (W)X(L)50 x 80cm/ 19.68 x 31.49'',300g Thickness: about 0.8cm Color: As the picture Package Includes : 1 x WordsBathroom Door MatPlease Note: 1. Please allow 1-3cm error due tomanual measurement. 2. Please understand that colors mayexist chromatic aberration. Turns your bathroom into a deluxe spa x000D As part of the Bambüsi collection of 100% natural bamboo products from Belmint, this beautiful and minimalist floor and shower mat is a wonderful addition to your life and decor. Enjoy the elegance and sophistication it brings to your bathroom, your poolside, and even your patio dinner while requiring little to no maintenance. The board's design is so versatile that you'll find endless uses for it both indoors or outdoors. It's the perfect addition to your happy home, and also makes a personable gift for a special someone. x000D x000D Slip-resistant x000D The mat comes with six soft pads which are securely screwed on to prevent from sliding while at the same time protect and stay firmly on the floor. x000D x000D Low-maintenance x000D As with any product, do not expose it to moisture for prolonged periods of time. Needs Only Warm Water & Brief Air Drying to Clean and air dry it after each use x000D x000D Modern, Stylish Bamboo x000D We constructed this mat with 100% Moso Bamboo, a renewable resource material that is sturdy and durable to last for years. x000D x000D Experience the best x000D The Bambüsi wooden floor mat gives your bathroom a contemporary look, bringing your space a mix of nature and style. 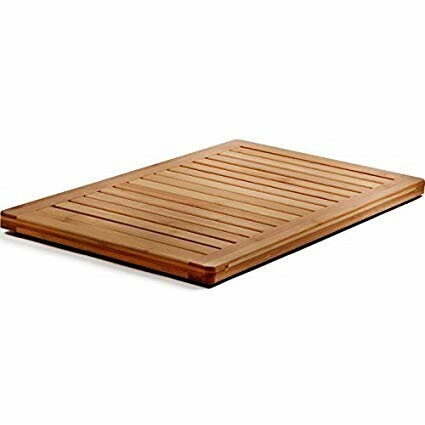 It provides a comfortable exit point that allows your feet to dry before you step away from your shower or tub x000D x000D Modern, stylish bamboo mat is remarkably versatile for variety of different uses x000D Its versatile design makes it perfect for an outdoor shower to keep your feet from getting sandy. 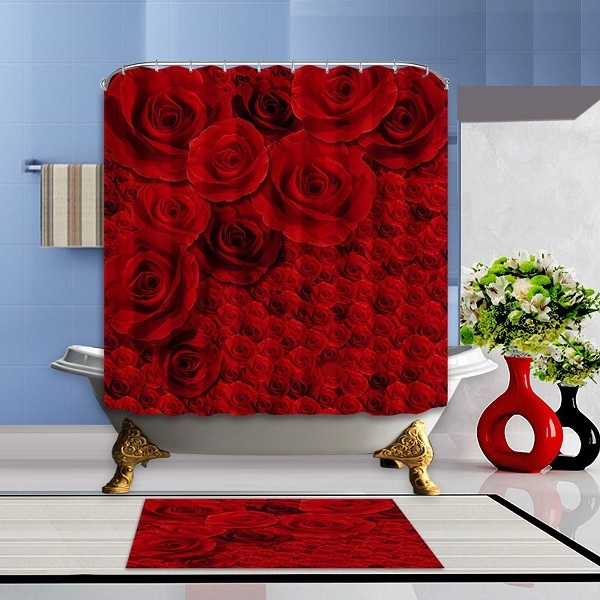 Use it in the pool area, backyard and indoor as bathroom shower mat or decorative piece. x000D x000D Made with 100% natural bamboo x000D This bamboo mat is brought to a flawlessly smooth finish to eliminate splinters and doesn't warp or crack like other woods and continue to serve you for way longer. Features: Made of polyester material, waterproof, anti-mildew and safe. Non slip bottom mat, machine washable, not fade. Designed to fit standardized bath tubs. Soft and comfortable hand feeling, easy to clean. Can stop splash water and offer an independent bath space. Specification: Material: Polyester Mat Material: Flannel Surface Non Woven Fabric Intermediate Layer Non Woven Plastic Bottom Color: As picture shown Hook Size: (L)X(W)5.8X4cm/2.28"X1.57"(appr.) Mat Size: (L)X(W)60X40cm/23.62"X15.75"(appr.) Curtain Size: (L)X(W)180X180cm/70.87"X70.87"(appr.) Packing Includes: 1 x Shower Curtain + 1 x Mat + 12 x Plastic HooksPlease Note: 1. Please allow 1-3cm error due tomanual measurement. 2. Please understand that colors mayexist chromatic aberration. Features: Made of polyester fiber material, warm&soft. Suitable for lots of places, such as living room, bedroom. Non slip backing provides safe and comfortable to you. 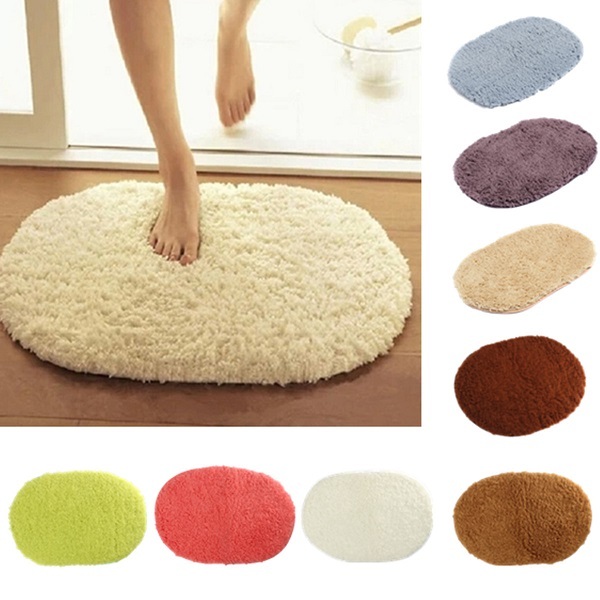 Specification: Main Material: Blended Fabric sub-components: Polyester Fiber Color: Brown, Blue, Purple, Grey Bath Mat Size: (L)X(W)80X50cm /31.5''X19.69''(appr.) Contour Mat Size: (L)X(W)50X40cm /19.69''X15.75''(appr.) Packing Includes: 1 Pcs Bath Mat + 1 Pcs Contour MatPlease Note: 1. Please allow 1-3cm error due tomanual measurement. 2. Please understand that colors mayexist chromatic aberration.